The original brief was simply to design a point of sale unit for displaying a leaflet on the range of damp proofing products. 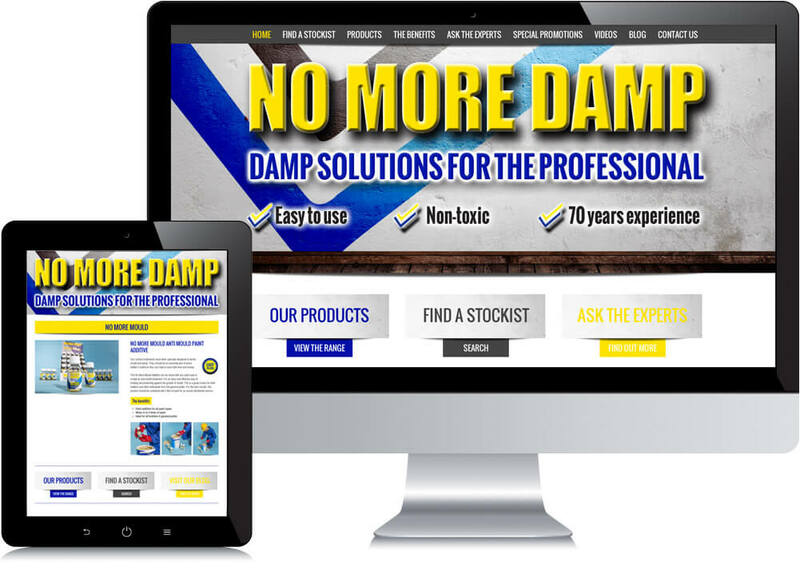 Piranha spotted an opportunity to create a stand-alone brand for the range of products and developed the brand “No More Damp” This has now grown into a nationwide campaign with the products now stocked in the majority of Builders merchants throughout the UK. To-date Piranha has developed the brand, designed packaging and labels, designed and produced point of sale information dispensers, designed POS product stands, designed and produced a gazebo for outside promotions, designed and built a trade website, implemented SEO, developed a blog campaign, designed and distributed trade advertising and written technical articles for trade building magazines. Piranha also manages and develops all the ongoing content for the website and provides content marketing and is also now working on the offshoot of the brand, “No More Mould” which is a range of mould prevention kits and paint additives.